Supergirl has been placed in stasis by the military after losing the battle with Lava Girl in the previous issue. Power Girl takes her from them before they can bring the Maid of Might to General Morrison. The encounter seems to do something to the two Karas. In addition to replenishing Supergirl's strength and halting the Kryptonite poisoning within her, it creates a mental bond between the pair of Kryptonian women. Only time will tell if this will help the Lost Daughter of Krypton. The combined might of Supergirl and Power Girl has made short work of the pursuing American armed forces. Yet, Lex Luthor has sent the gargantuan Appex to test the limits of the ladies' powers. Alone, the Woman of Steel and the Girl of Tomorrow seem to be no match for the brute. Together, their titanic powers help defeat Appex with a double-sized super punch. Unfortunately, victory cannot be celebrated for too long. Supergirl's Kryptonite poisoning has returned with full force. Worse yet, Power Girl is feeling weak from its effects. The Lost Daughters of Krypton will have to work fast if they are to save themselves from certain death. Power Girl has brought Supergirl to the underwater Sanctuary, where the artificial intelligence works on treating the latter and gives the former a new, less tattered costume. Supergirl feels better afterwards, but the poison is still in her system. Power Girl promises that they will find a cure together. Suddenly, believing its mistress is in danger from a clone attack, Sanctuary targets its weapons on Power Girl. 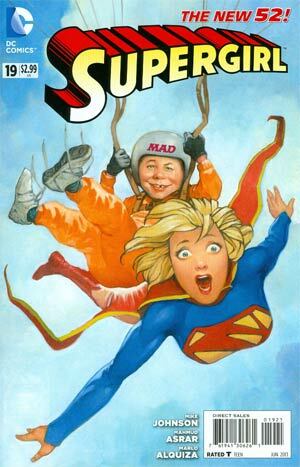 Only the next issue will tell us if she and Supergirl will escape this new menace unscathed. The previous issue threw me off a bit because I wasn't used to the guest writer's style. After reading this one, the direction feels more clear. It's great to have Mike Johnson back. This title won't be the same when he goes away. The whole meeting between Power Girl and Supergirl wasn't done in the typical fashion. Normally, there's a misunderstanding that makes the two heroes fight each other. Johnson doesn't use that plot device. Instead, he makes both heroines kindred spirits. I honestly look forward to the next chapter of this story arc. Let's hope it's as good as this one. Art - 4: Mahmud Asrar is a great artist and does provide us with some wonderful panels in this issue. Yet, for some reason there are images that look a bit too much like Manga for my tastes. Some Manga is good, but in general, I'm not a huge fan of that style. In spite of that, we still have some incredible visuals that show Asrar's strengths throughout this issue. Cover Art - 5: This cover has everything a great cover should have. It gives the buyer a taste of what's going on in the book, and makes them want to hurry up to read what's inside. Mahmud Asrar seems influenced by the comics of the Silver and Bronze Ages with all his images. I'm going to miss his work when the new creative team takes over.